This is small beans in the grand scheme of things, but it still hurts. 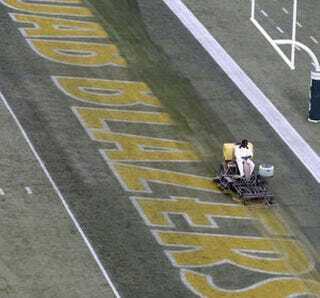 When UAB announced it would shutter its football team at the end of the season, the 6-6 Blazers still had hopes that the season—the program—could go out with one more game. Time to give up on hope, according to this ESPN report. It's largely a problem of math. Conference USA rules send five teams to affiliated bowls, and there are exactly five teams with better records than UAB. So they'd need an at-large bid, but there will be anywhere from 79 to 81 bowl-eligible teams seeking 76 berths. Someone's going to be left out, and according to Brett McMurphy's source, it's the Blazers and their baggage. "No one will touch them with what's going on with the program since other options exist," the source said. Well, that's cold. But the bowl system seems to have a thing about excluding the teams to whom a bid would mean the most. It's just more insult to injury for the Blazers. This week has seen tears and anger, but it seems UAB won't see any more football.